If you have been DREAMING of losing weight, dropping kilograms of excess fat and getting a flatter belly, then I need you to know that “just dreaming” is NOT enough! The people who SUCCEED at something are those who actually “create a plan and run with it”. And this applies to weight loss, losing fat and getting an amazing toned and fitter body too. My first question to them is: “What is your plan of ACTION to actually lose weight”? And 9 out of 10 times, the answer is…I don’t have one! If you don’t have a plan of ACTION to lose weight, you will NOT succeed! Remember that quote “To fail to plan is to plan to fail“? That quote is ABSOLUTELY True! The best quote ever! Whatever your goal is in regards to getting your body back in shape, getting a better body that gives you confidence, you have to PLAN for it. You cannot continue to “overeat lots of fatty foods like pounded yam, chocolates, sausages and other unhealthy snacks” and expect to achieve your goal. You need a PLAN of action. Something to work with, work towards and set your mind to achieve. And today, I want to show you how to use SMART, which is a management method, to PLAN for your weight loss success. Write clearly what you want. Write down how you plan to get it. EXAMPLES: I want to drop 2 dress size. I want to lose 30kg. I will eat healthy meals daily. I’ll stop eating chocolate daily and eat healthy snack instead.I will set aside 20 minutes daily to start working out. I will plan my workout. I will read weight loss emails, I will subscribe to a fat loss program like The 30 Day Fat Loss Program etc. EXAMPLES: I want to become a size 10 (UK), I want to lose 2 inches from my belly. I want to be able to wear my size 10 jeans again etc. Is it achievable? Don’t set it too low that its easy; Don’t set it too high that its IMPOSSIBLE to achieve too. EXAMPLES: Saying “I want to lose 40kg in 1 month” is NOT healthily achievable. Writing “I want to lose 1-2kg per week” or “Drop 1 dress size in 30 days” is realistic and achievable. How realistic is your goal? Does it make any sense? Expecting that you will “Get a flatter tummy while eating junks or fatty foods” is absolutely unrealistic. Setting up plan for yourself to “Eat healthy snacks to replace the unhealthy fatty ones” is realistic. 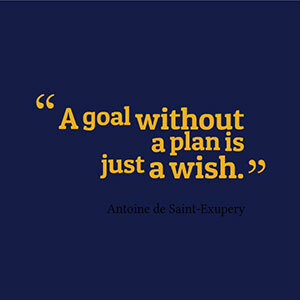 When do you want to reach your goal? How long will it take you? The time frame you set for youself will help you break down your goal into smaller goals and work towards achieving those small goals which turns into a “BIG GOAL” at the end of the day. EXAMPLE: If you set out to lose 10kg, and you give yourself a time frame of 7 weeks to achieve this. You can break it down to losing 1.5kg every week. So…right now, I want you to write out a plan to achieve your weight loss goals following what I just showed you and using the examples I gave above. It will only take 5 – 10 minutes of your time to do this simple exercise and you will gain CLARITY on exactly how to lose weight successfuly and keep it off. Start working towards achieving the goals you’ve set and written down for yourself and every time you achieve these goals, simply tick them off your list and you will be amazed at how fulfilled and happy you will be. And if you want a fat loss program that works that will help you measure all your SMART goals and help you achieve every single one of them, subscribe to The 30-Day Fat Loss Program here. This program has been used by over 1,000 REAL Nigerian men and women who have used it to get a trimmer and amazing toned body. And its your turn too. I hope you’ve learn’t a lot from today’s article. If you have, and you’ve written down your own goals using the SMART method, please leave me a comment below.